Fine cars and fine dining . . .
. . . That is what awaits visitors to the new "Restaurant 356" located at the new $100 million Porsche Cars North America headquarters in Hapeville. 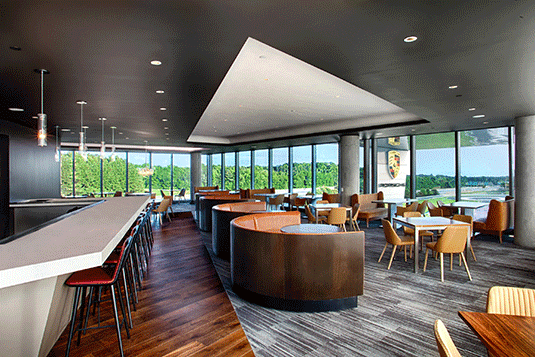 With panoramic views of the world-class 1.6-mile driver development track, 356 is sure to become a premier dining destination for local patrons and for visitors to Atlanta. "Atlanta is a city known for its diverse tapestry and international cuisine," said Andre Oosthuizen, vice president of marketing for Porsche Cars North America, Inc. "At Restaurant 356, our guests will enjoy elegant dishes that honor Atlanta's global flavors, while culminating a unique Porsche experience." Located on the second level of the Porsche Experience Center, 356 offers a distinct view of aircraft taking off and landing at Runway 826 Right at the Hartsfield International Airport. Innovative dishes are served inside a dining room featuring a contemporary decor. The seasonal menu showcases a refined world cuisine made with locally farmed and foraged ingredients. A vast wine selection pays tribute to the great winegrowing regions of the world. Classically-focused cocktails are available for those favoring tradition. At the helm of Restaurant 356's purist approach to food is Executive Chef Kyle Forson, former executive sous chef at The Spence. Forson focuses on carefully hand-crafted dishes that let the quality of seasonal ingredients shine through. While guests can expect to see influences from Forson's own Polish heritage and experiences with French, Californian, and Southern fare, no single type of cuisine will dominate the menu. "I want guests to enjoy food that enhances the Porsche experience and fuses it with a sense of place," said Chef Forson. Restaurant 356 is open to the public Thursday through Saturday for dinner, Tuesday through Friday for corporate booked lunch events, and is closed on Sunday and Monday. Reservations can be made through the restaurant's website (www.restaurant356.com) or via OpenTable (www.opentable.com/restaurant-356). Restaurant 356 also provides catering and serves as an event venue.